Cod is a fantastic fish to eat but it is generally just used for deep-fried battered fish and chips in this country which, nice though it is to eat occasionally, is a pretty unimaginative thing to do with a nice piece of cod. 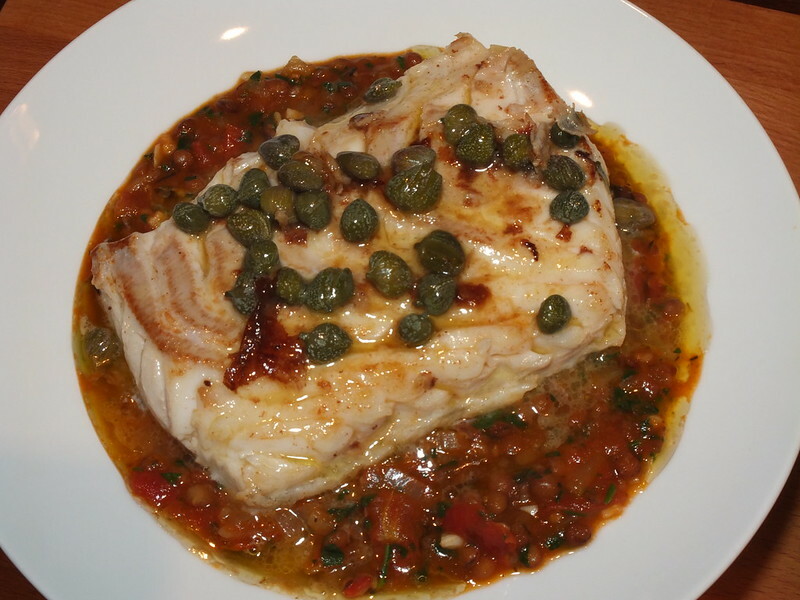 The other way that cod tends to be cooked in the UK is poached cod with a parsley sauce. Yet again, nice enough but unimaginative. Then again, pieces of cod can pop up in the mix of fish for a fish pie, which is a thing of joy, but hardly showcases the cod itself. Because cod is a meaty fish, with firm flesh it can be roasted in the oven or fried on the cod in butter and olive oil and it is the latter method that I used here. I had a lovely piece of skinned and boneless loin of cod (from a sustainable source, of course) which I salted and peppered and simply fried in olive oil and butter for about 6 minutes, turning it once and basting it in the butter. Then I added the juice of a lemon to the pan and a heaped tablespoon of capers. I let this bubble up and amalgamate with the buttery juices in the pan and served the fish. I decided to cook some lentils with garlic, tomatoes, chopped shallots and parsley to accompany this. Of course, the lentils take longer to cook than the fish, so I made this in advance and reheated it while I was cooking the fish. This was a tasty and satisfying accompaniment to the cod, which was the real star of the show. To go with this, I had a bottle of Macon Villages, a white Burgundy wine from the southern end of the region, but any dry and reasonably full-bodied white would work well.